United Airlines bears no responsibility for the hijacking of a flight that two terrorists boarded after flying from Portland to Boston, he says. NEW YORK — United Airlines cannot be held responsible for the hijacking of the American Airlines flight that Mohamed Atta and Abdulaziz Alomari boarded after flying to Boston from the Portland International Jetport on Sept. 11, 2001, a federal judge in New York ruled Wednesday. U.S. District Judge Alvin Hellerstein dismissed the claims that World Trade Center Properties, an affiliate of leaseholder Silverstein Properties, brought against United and its parent company. They were among 19 defendants — primarily aviation and security companies — sued over the collapse of 7 World Trade Center, a building that caught fire and fell after it was struck by debris from the north twin tower. Among the claims made by World Trade Center Properties was that the defendants were responsible for security at the Portland jetport and Logan International Airport. The suit claimed that Tower 7 was destroyed because of the defendants’ negligence and that United had the opportunity to prevent the hijacking. Atta and Alomari had spent the night of Sept. 10, 2001, in a South Portland motel. The following morning they went through the single security checkpoint at the Portland airport and boarded U.S. Airways Flight 5960, a commuter flight operated by Colgan Air, to Boston. At Logan, the pair went through a security checkpoint and joined other hijackers on Los Angeles-bound American Airlines Flight 11. 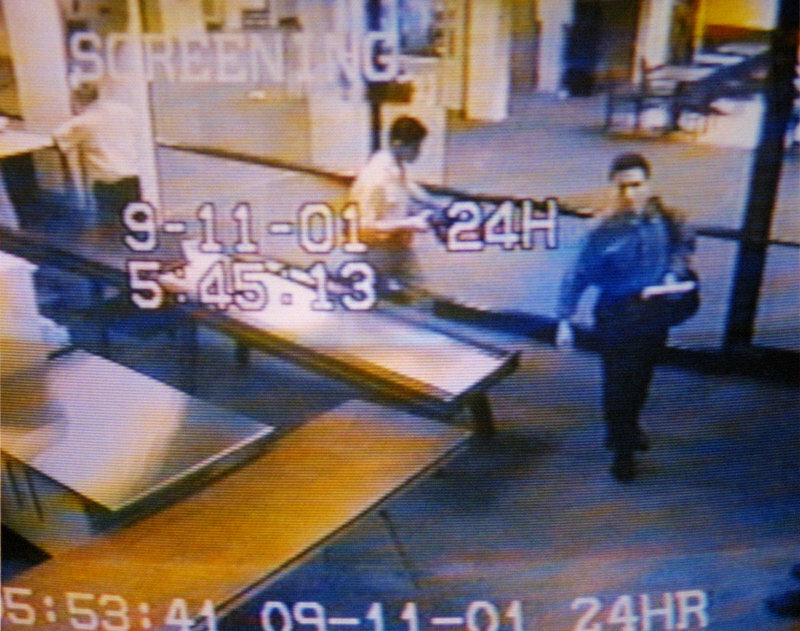 “It was not within United’s range of apprehension that terrorists would slip though the PWM security screening checkpoint, fly to Logan, proceed through another air carrier’s security screening and board that carrier’s flight, hijack the flight and crash it into 1 World Trade Center, let alone that 1 World Trade Center would therefore collapse and cause Tower 7 to collapse,” Hellerstein said. In Boston, Atta and Alomari went through one of two checkpoints operated by Globe under a contract with American Airlines. The claims against nearly all the other defendants in the sprawling suit remain in play. The claims against Continental Airlines and ICTS International, the Dutch parent of Huntleigh USA Corp., a Missouri-based security company, were terminated last year. Continental merged with United. A spokesman for Silverstein Properties said the company was disappointed by Hellerstein’s ruling, but noted that it was limited to the narrow question of whether United shared liability for the security lapses Silverstein alleges led to the hijacking of American Airlines Flight 11. A separate suit against United deals with the United Flight 175, the hijacked plane that struck the south tower. “The main claim against United, for its security lapses leading to the terrorists’ crashing United Flight 175 into the World Trade Center, is proceeding. We are determined and look forward to presenting the facts before a jury,” Silverstein spokesman Bud Perrone said in an e-mailed statement. United spokeswoman Mary Ryan said the company would not comment. The lawsuit was filed in the Southern District of New York in 2008. The case has moved slowly, in part, because Hellerstein oversees most of thousands of lawsuits arising from the terrorist attacks.